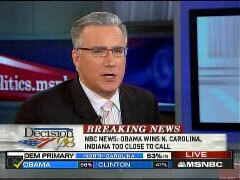 During Tuesday's coverage of the Democratic primaries in Indiana and North Carolina on MSNBC, co-anchor Keith Olbermann dismissed the importance of the finding that approximately half of primary voters considered Barack Obama's pastor Jeremiah Wright was an important factor in their decision, including some who apparently admired the way Obama reacted to the story. And, without naming Fox News, the MSNBC host seemed to accuse FNC of having "done nothing but broadcast this story since it first broke, with the wildest exaggerations and the broadest of interpretations possible." He further expressed relief that, in his view, Wright had not been a strong factor against Obama in the election: "It really does, thank goodness, prove, I think, some of the limitations of the media and of negative campaigning." And yet, with the saturation, including one television operation that has done almost nothing but broadcast this story since it first broke, with the wildest exaggerations and the broadest of interpretations possible, with this thing being hammered again and again in all kinds of different outlets, the exit polling today was, it was about a 50-50 split, whether it made any registration at all with these voters in these two states. And that included not just those with whom it made a negative registration, but also those who might have thought he did a good job separating himself from Reverend Wright after the last set of, sort of, goofy comments. So the whole thing about how big an issue this was, and not just how big a negative issue, it really does, thank goodness, prove, I think, some of the limitations of the media and of negative campaigning.